Alright now, we’re about to get a little bit crazy on the Linzer Heart variations. 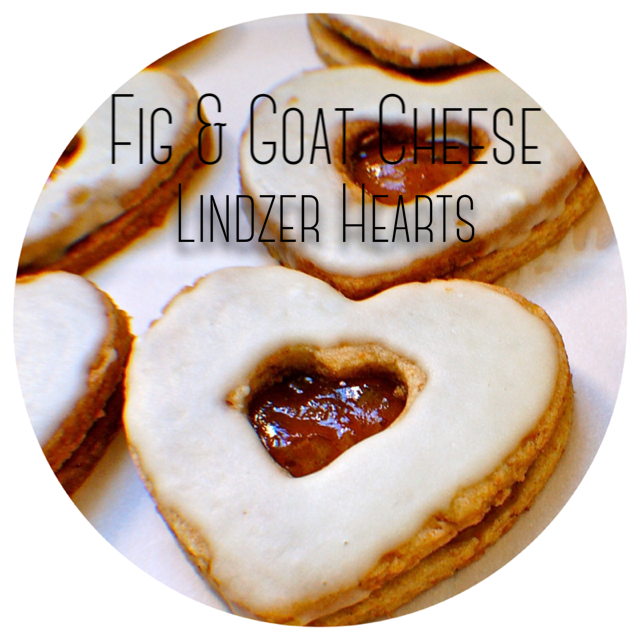 This one was dreamed when I started to think about using wheat flour in my Linzer Hearts. I thought about what I’d like to have on a nice, dark wheat piece of toast and immediately thought of goat cheese. Which made me think of fruit compote or jam with it. Which made me think of wine country. Which then made me text my girlfriends about whentheheckisournextNapatrip?! 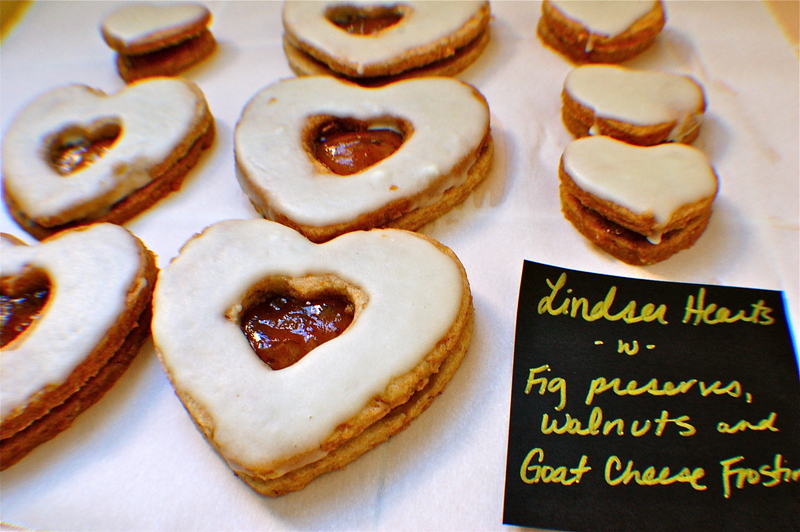 While I was dreaming up this Napa trip, I decided to make a version of the cookies with Figs and a Goat Cheese frosting. Of all the Linzer Heart versions I made, this one took more iterations (mostly in the goat cheese frosting category) and the one I received the most raves from my coworkers. Hope you enjoy! I experimented with different flours as part of my Baking Flours 411, so please use this recipe to substitute the flours of your choice! *I’m telling you, freshly grated nutmeg is waaaaaaaaaaaaaaaay better than the dusty kind you get from the grocery store. Head to Williams Sonoma (like you need an excuse to go) and invest in whole nutmeg, and a special nutmeg grinder or a microplane. You’ll thank me in the end, especially if you’re using it over some fresh whipped cream and hot apple cider. Toast walnuts in 350 degree oven for 5-10 minutes. Watch them CAREFULLY as they burn easily. Once you start to smell them, take them out – they’re done! Cream butter and sugar in mixer on high. Add in vanilla and mix until incorporated. In a separate bowl, sift together flour, salt, nutmeg and toasted walnuts. Slowly add flour mixture to butter mixer 1/2 cup at a time until incorporated. Chill for 1 hour. Heat goat cheese for about 5-10 seconds in the microwave (heated goat cheese is easier to deal with). Mix together goat cheese, powdered sugar and vanilla. 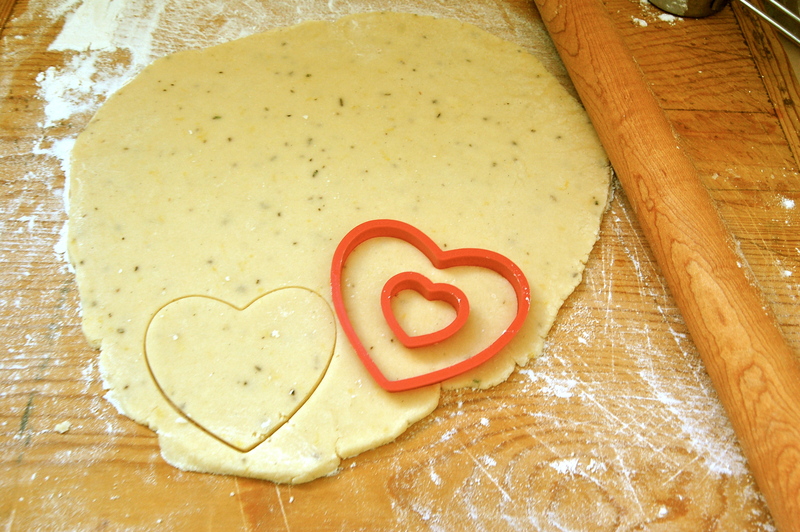 To assemble, cover the solid heart with the fig preserves. Ice the cut-out heart top. If you love nutmeg like I do, dust the tops with more freshly grated nutmeg. Once tops have dried fully (refrigeration helps), press together like a sandwhich. Except much yummier and prettier! Now, take these to work for your coworker’s enjoyment or, even better, take them to Napa and enjoy with a glass of Pinot Noir!